Today I did something interesting. We went to Target in search of some dress shoes for the Toddler. I went a little crazy in the shoe section … everything was on sale. I found a new pair of crocs for him along with some dressy shoes. THEN found a super fun pair of gold flip-flops with rhinestones on them — for me. I slipped them in the cart when Husband wasn’t looking. I think he noticed anyway. THEN I found the rainboots. 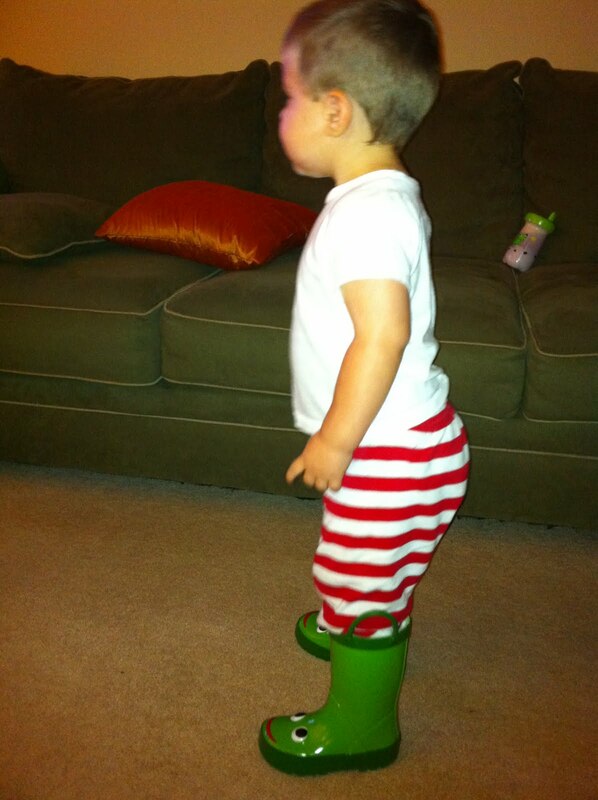 Nothing is cuter than a little boy in some rain boots. I put them on the Toddler to see how they fit and he was so excited about them that he refused to take them off until we got home. Husband wasn’t thrilled about the boots, so I put my fancy flip flops back. In exchange for the boots. Because they were so stinkin cute. This is motherhood — putting something back that you really want, to get something for your kid instead. I never imagined I would become so unselfish over frivilous things. Seeing him happy makes me the happiest I have ever been. I can see how some people end up going overboard and spoiling the crap out of their children. I do not plan to spoil the crap out of my children. But today … I’m enjoying it.